Time for another slice of highsec life. 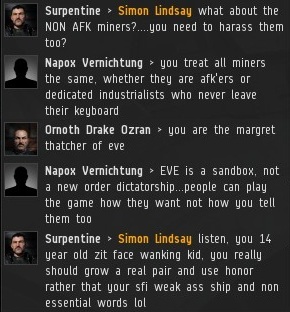 This is the Highsec Miner Grab Bag. After a single Mackinaw loss, Ambramotte Ambramotte decided EVE isn't the game for him. I have no respect for quitters, but I suppose it's better he quits now rather than wasting more years of his life mining. 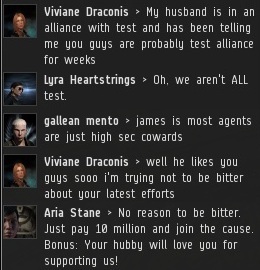 In local, Ami's alt announces that she's changed her mind, and will be quitting EVE. I might get some flak for saying this, but from a purely mathematical point of view, it's possible for highsec to reach a state of 100% compliance either by converting all the miners, or by getting all the non-compliant ones to quit EVE. Again, that's just the mathematics of it; I'm not saying that's our intention. 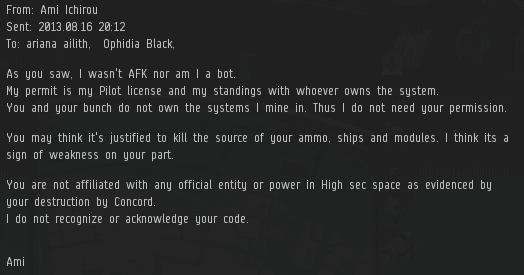 For miners to become proper EVE players, they must obey the Code. To obey the Code, they must stop botting and must become aware of the New Order and its Code. Eathotophotons Alienslime was almost there. Something old and something new. Ornoth Drake Ozran offers up a rare Margaret Thatcher comparison, while Surpentine goes the traditional route of calling bumpers 14 year old zit face wanking kids who lack honour. 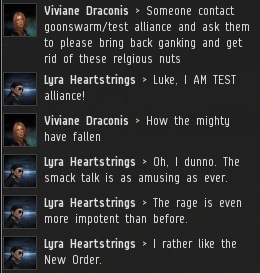 Is it my imagination, or are the bot-aspirants of highsec starting to get a little defensive? Seems like they know they're guilty, and the social pressure is getting to them. As for Daniel archmos, I refer him to the Code. TiffanyBree, I would remind you of two things. First, I have nothing against mining. I greatly value legal mining; it's illegal mining that I'm against. Second, miners don't enjoy mining. Carebears across highsec have been horrified by the zeal that the New Order has for its mission. They're used to complaining about Goons and TEST, but they cannot kill an idea. Luckily, there's no need to try killing our ideas. Simply pay 10 million isk, do what we tell you, and go about your business! After being ganked by Agent Tinker Vuld and apprised of his rights and responsibilities under the Code, Pasanete Oda decided he would rather quit mining. One less miner to worry about. Speaking of impotent rage, behold Zion Zorngarin. Biggie09 suggests that he might prove he's not AFK by typing something once every 20 minutes. That would be great, except that someone would be able to get away with mining AFK for 20 minutes! 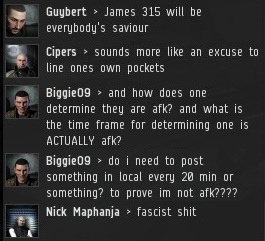 The best way to test for AFK'ers is to see their reaction time when you address them in local. If they take longer than 5 seconds or so to react, I consider them a miner of interest and proceed under the assumption that they're AFK or have AFK tendencies. Reasonable, no? So much for "fascism". 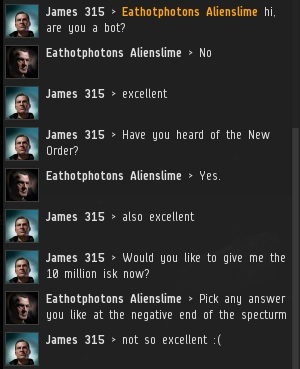 "Simply pay 10 million isk, do what we tell you, and go about your business!" What will you do when an Agent turns up in yours? Zion Zorngarin's tears have that spicy aftertaste that makes them delicious! 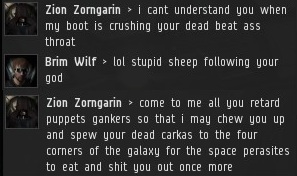 New players are ruined by that attitude of yours...you make them believe that highsec is safe, and later it's harder for them to learn how the game truly is, when they lose ships that are a lot more expensive. Hmmm, or you could make the case that new players have just as much of a right to know how the game is played as well as older players. Why let those new players fall into the trap of believing that Hisec is a "safe" or "PvP" free space, with them falling into bad habits and beliefs. I say that new players are perfect for the message of the Code. Spread the word before complete botification has occurred. Like those bounties on the CODE. heads. Think it's time to do a little collecting and start charging you for entering HS. A lil' 111 member alliance? I think 50m/mo/member to get to a HS station is a reasonable fee. We'll let you know when to start paying and to whom you will be writing the check. Reasonable? No. -So much fascism!